The satin ribbon with gold edges is actually capable of highlighting the article decorated using it. The satin ribbons we offer are added with a touch of gold on the edges. The use of these can exaggerate the elegance of decorations and adornments at some celebration or embellishments for gifts. 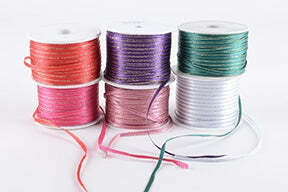 These types of ribbons are offered in 1/8 size with the best quality manufacturing. These kinds of cute and sleek ribbons are best to be used for craft needs as well as for the decorations at parties and for adorning dresses. Well, if you are keen to show your creativity by making beautiful craft items, then you can make the best use of these attractive and colorful ribbons by making cute looking craft items using these. So, if you need to add a sparkling effect to your decorations then using the satin ribbon with gold edges is a perfect option for you to go with.